On Christmas Day, the Manitoba Moose were last in the AHL with a 12-16-2-0 record. Three months later, they’re two points out of a playoff spot and fifth in the Central Division with two games in-hand on the fourth-place Texas Stars. While at Christmas, the playoffs seemed a distant dream, the Moose have shown tremendous mettle in flipping the script and putting a berth within the realm of reality. In March, the unlikely underdogs posted an 8-3-2-0 record and interjected themselves further into the Calder Cup Playoff conversation. The Moose were handed a little extra adversity prior to their first game of the month — a Friday-night matchup with the Belleville Senators and the fifth game of their Canadian road trip. Eric Comrie was called up by the Winnipeg Jets on an emergency basis just hours before puck drop as Connor Hellebuyck had the flu and couldn’t start against the Nashville Predators in Winnipeg. That thrust flashy, enigmatic rookie goaltender Mikhail “Birdman” Berdin, on his 21st birthday, into the crease against a Senators squad which had captured points in 15 consecutive games. While the Moose couldn’t stop the Senators’ point streak from going to 16, they came out on top 3-2 in overtime, largely to Berdin’s brilliance. He made 32 saves in regulation and robbed Nick Paul on an overtime penalty shot. That gave Seth Griffith the chance to play hero, as he scored the game-winner (just as he’d done in their final February contest) less than two minutes later. It was his second goal of the game and fourth in his past two. In the rematch the following evening, Berdin was strong again and made a number of 10-bell saves (31 saves on 34 shots). However, the Moose left their scoring sticks at the hotel, got shut out 4-0, and finished their road trip with 2-4-0-0 record. The Moose then returned to Bell MTS Place, where they’d gone a scintillating 12-1-0-1 since Christmas. Their first guest was the fourth-place Rockford IceHogs, who came to Winnipeg with 63 points, four more than the Moose. The weekend series was paramount — a loss in either game would have likely meant curtains for the Moose’s Calder Cup Playoff hopes — and they came to play, winning both games. First, they captured a 3-1 Saturday-night victory thanks to multi-point nights from Alexis D’Aoust and Kristian Reichel. They didn’t have much time to revel in the victory as the two teams took right back to the ice on Sunday afternoon for a rematch. 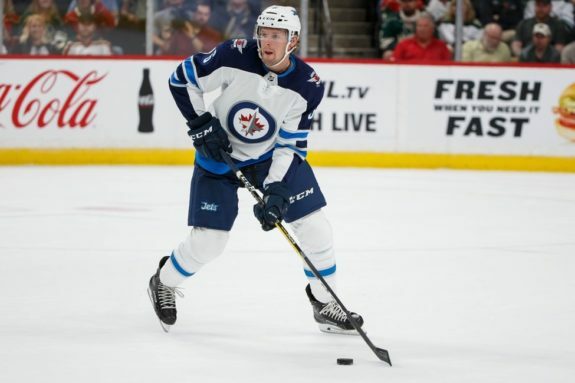 The home side found themselves down 1-0 midway through the third, but Mason Appleton fired home a power play one-timer — his first Moose goal since returning to the club after a 36-game stretch with the Jets — to draw the game even. The game went to overtime, where Appleton also contributed to the game winner, driving the net and producing a rebound for Michael Spacek, who out-waited IceHogs netminder Kevin Latkinen and made no mistake in tight. By the end of play March 10, the Moose found themselves one point behind both the IceHogs and Milwaukee Admirals and three behind the Texas Stars, who leapt into fourth. Speaking of the Stars, they landed at Bell MTS Place for two games critical for both sides, as they were just four points apart in the standings. The two matchups proved to be ultra-competitive, higly-entertaining nail-biters. On March 13, with the game tied 3-3 in the third, Felix Gerard banged in his own rebound to give the Moose a 4-3 lead, which they wouldn’t relinquish. The win cut the Stars’ standings leads to two points. 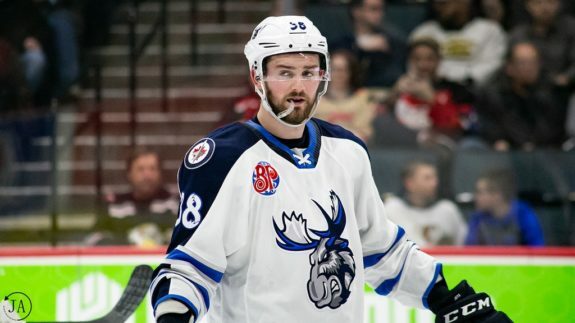 In the March 15 rematch, the Moose entered the third period down 4-1, but roared all the way back to tie the game 4-4 and force overtime as Appleton, Marko Dano, and Jimmy Oligny scored three straight goals in less than six minutes. However, the Stars escaped with the extra point as Michael Mersch streaked down the wing during the three-on-three and snapped one short side on Berdin, who’d replaced Comrie after the latter allowed three goals on 10 shots in the first period. The homestand concluded with two games against the San Diego Gulls. In the first, on St. Patrick’s Day, Kristian Vesalainen played his first game with the Moose since November as the top prospect returned to North America after Jokerit, his KHL team, was knocked out of the playoffs. 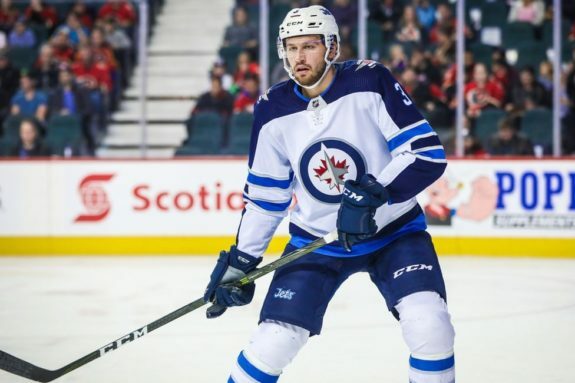 Related – Jets to Jokerit: Did Vesalainen Make the Right Choice? However, he did not help the Moose find any luck on St. Patrick’s Day. Comrie once again allowed three goals in the first and they fell 4-1. In the rematch, the Moose built an early 3-0 lead thanks to two points from Ryan White (who’d missed all of December, January, and February with injury) and a gorgeous end-to-end, one-on-three solo wraparound effort by Logan Shaw. However, they all but frittered the lead away as the Gulls drew even with two late first-period goals in eight seconds and a mid-third shorthanded tally. The game went to overtime, where Vesalainen gave his side a win that should have come a lot easier when he dangled a d-man and stuffed the puck past Jeff Glass. The beautiful goal capped a 4-1-1 homestand and drew the Moose within two points of the IceHogs for fourth place. The Moose then departed for a five-game road trip that began in Colorado with matchups against the Eagles. On Friday, March 22, less than 12 hours before their first game, the Moose were dealt some bad cards and lost both of their goalies. 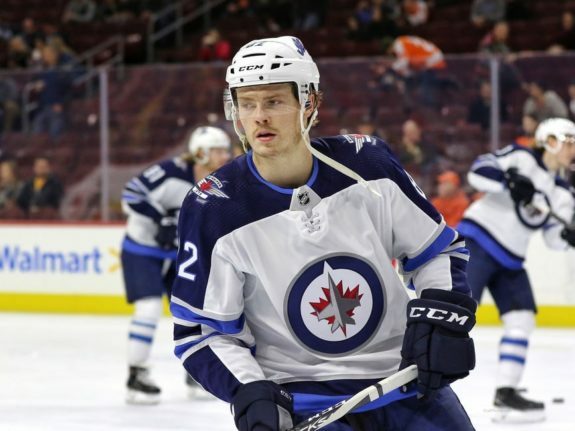 First, Comrie was called up to the Jets to back-up Hellebuyck due to an injury Laurent Brossoit suffered the previous night in a game against the Vegas Golden Knights. Then they discovered Berdin had sustained a non hockey-related injury and couldn’t play. However, goaltender Ken Appleby — who was with the ECHL’s Jacksonville Icemen and hadn’t played with the Moose since late January — came to the rescue. 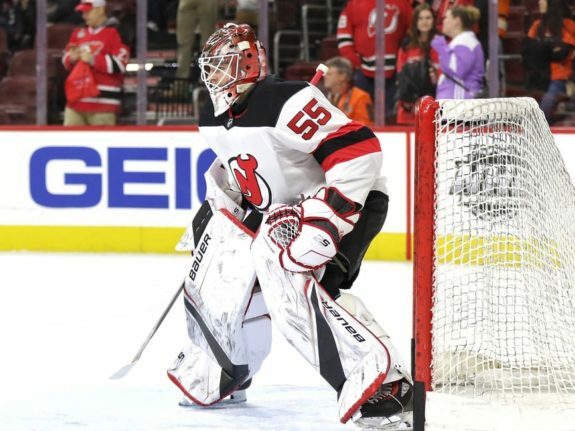 He flew nearly coast-to-coast from Norfolk, Virginia and barely made it for puck drop, but stood on his head and posted a 32-save shutout (and also notched an assist) in a massive 2-0 win. Appleton and JC Lipon both scored in the contest. The Moose had an opportunity to sweep the four-game series with the Eagles the following day and did so. The feisty game was tied 2-2 through regulation, and Tucker Poolman, already with a goal in the game, scored the overtime winner on a backhand rush. The win jumped the Moose into fourth place as both the Stars and IceHogs lost. Quite the logjam. Here’s how the Central Division looked after play on March 23, with the Moose leaping into fourth place. The Moose wouldn’t remain in a playoff spot for long, though. In their third game of the road trip and first of three straight in Texas to end the month, they fell to the Stars 3-2 despite holding a 2-1 lead in the third and were leapt in the standings as a result. 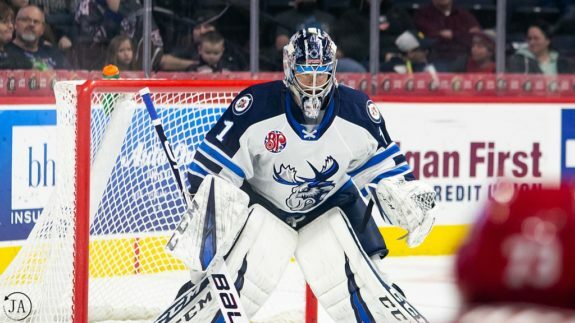 On March 29, the Moose got back to their winning ways with a 2-1 victory over the San Antonio Rampage — White scored both of their goals and Berdin was outstanding again with 27 saves. However, the Stars also won and hence the Moose remained out of a playoff spot, possessing 74 points to the Stars’ 75. In their final game of the month, the Moose looked to be well on the way to a victory, holding a 3-2 lead in the third powered by goals from Hunter Fejes, Girard, and Griffith. However, they allowed the equalizer to the Rampage’s Klim Kostin with just 1:08 to go and fell in overtime, 4-3. They still grabbed a point, but truly needed two as the Stars won yet again. Poolman, over the past two months, has become the de-facto leader of the team’s blue line. 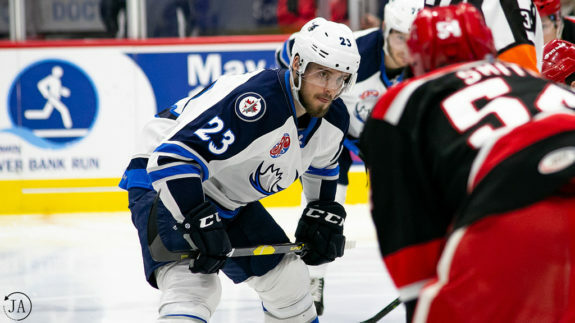 Just like he did in February, he logged huge minutes in all situations, playing such an outstanding game that it led head coach Pascal Vincent to say Poolman was “in the wrong league.” With reliable d-man and captain Peter Stoykewich limited due to appendicitis, Poolman’s contributions were paramount to the Moose’s success. Poolman tallied two goals and five assists throughout the month, but missed the final game of March due to an injury he suffered the previous game. It will be a huge hole to fill for the Moose if he’s out down the stretch. The veteran of nearly 500 AHL games was another stalwart on the Moose d-corp. He enjoyed his best offensive month of the season, posting three goals and five assists and pushing his plus/minus rating to a plus-nine, second on the team to Lipon. Schilling is tied with Poolman for the lead among Moose d-men with 25 points. Despite a solid month, the Moose weren’t a particularly high-scoring team, notching just 2.46 goals per game. The most consistent offensive producer was Dano, who registered three points and six assists and was especially prominent as a net-front power play presence. The Dane now has 27 points in 44 games. Logan Shaw played the 200th AHL game of his career on March 1 in Belleville. Seth Griffith played the 300th AHL game of his career on March 2 in Belleville. Mason Appleton played the 100th AHL game of his career on March 9 against the IceHogs. Head coach Pascal Vincent won his 100th AHL game as a coach on March 9 against the IceHogs. Alexis D’Aoust played the 100th AHL game of his career on March 19 against the Gulls. Jimmy Oligny played the 300th AHL game of his career on March 29 in San Antonio. The Moose have just seven games left and it looks like their playoff fate will come down to the wire. Every game in April will be incredibly important, but none of them will be easy. 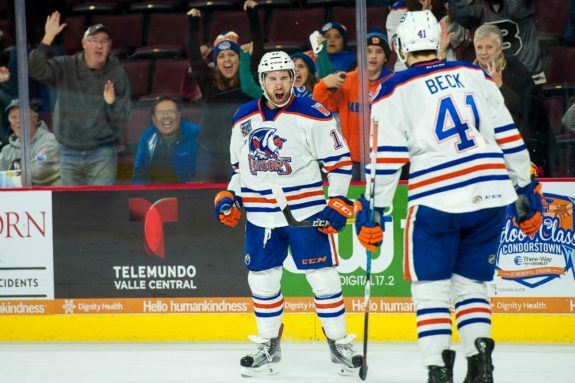 They’ll start the final push with their last homestand of the season between April 2 and April 7 — the Bakersfield Condors and the Stockton Heat will visit Bell MTS Place for a pair of games each. Combined, the Moose are 1-3-0-0 against those two squads this season. Then they’ll play three games in three straight days on the road from April 12 through 14 to wrap up the 76-game regular season: one against the Grand Rapids Griffins before two against the Chicago Wolves. Will the game against the Wolves be their last matchup, or a prelude to the playoffs? Regardless of which it is, you have to respect the Moose for pulling themselves out of the basement in 2019 and making their late-season games meaningful.